Each Box contains Two Autographs, One Memorabilia Card, 12 Rookies, 12 Parallels, and Nine Inserts! 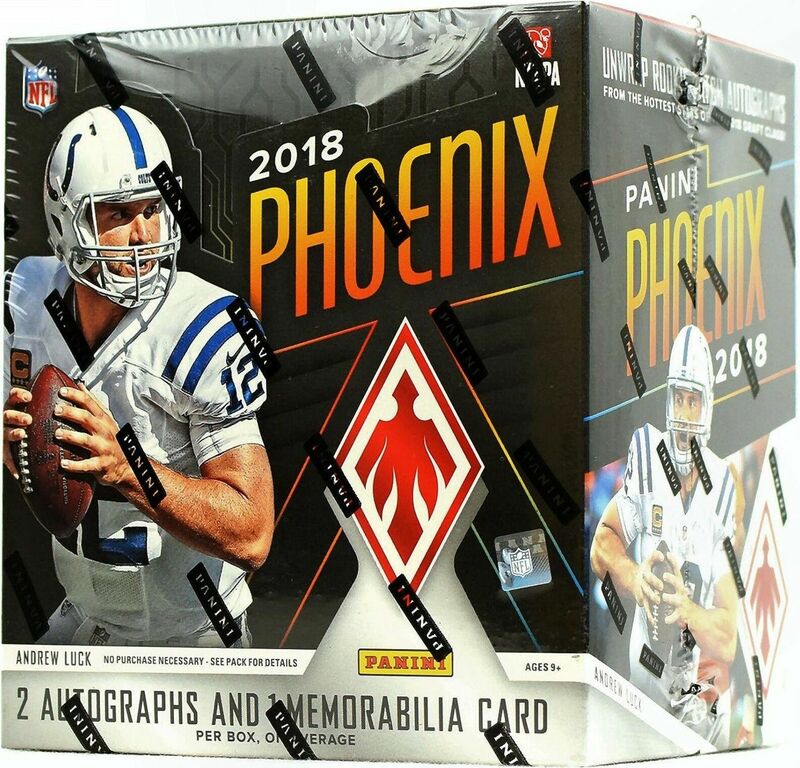 Phoenix rises to the hobby scene once again for the 2018 NFL season! Find one of the hottest brands back on shelves with 2 autos and 1 mem per box on average! Chase the biggest autographs of the 2018 NFL Rookie Class in three auto/mem inserts: RPS Rookie Auto Jersey, RPS Rookie Jumbo Autos, and Rising Rookie Material Signatures! Find spectacular prime versions of these cards and special versions of Rising Rookie that feature pieces of gloves, helmet, and NFL footballs! Be on the hunt for special Color Burst hot packs! These packs fall one per box on average and contain vivid variations of base, rookie cards and inserts! Find jumbo pieces of authentic NFL memorabilia in RPS Memorabilia, Jumbo Memorabilia and Veteran Materials! These inserts feature some of the top players in the NFL and contain parallels as rare as Super Prime 1/1! Look out for special 1/1 NFL Shield parallels of RPS Rookie Auto Jersey, Jumbo Auto Swatch and Rising Rookie Material autograph cards!